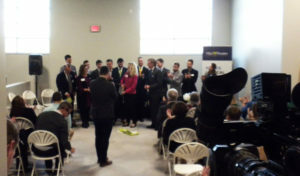 Lawmakers, advocates and company officials were on hand for the ribbon cutting at the MedPharm medical marijuana production facility. The first company to legally grow marijuana and manufacture medial marijuana products in Iowa held a ribbon cutting today at their facility in Des Moines as advocates who worked for years to make it possible looked on. Nelson says those who pushed to make a change in Iowa that lived to see it — and those who did not — should be credited for seeing the facility become a reality. 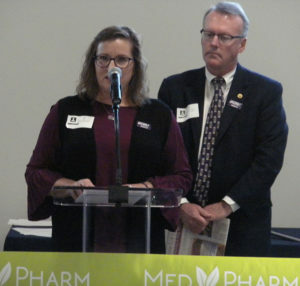 “Iowans suffering from debilitating medical conditions knew there was an alternative to the pain they lived with daily. They invested thousands of hours pushing for legal access to medical cannabis,” he says. “They testified in front of numerous committees — sharing emotional stories about their conditions, and the conditions from which their children suffered. The Gaers talk about the push for legalized medical marijuana production. Lucas thanked lawmakers for approving the change in the law and the governor for signing it. He then introduced Sally and Steve Gaer , who were lead advocates for medical marijuana as a way to help their daughter with her seizures. Gaer got emotional as she recalled talking to State Senator Joe Bolkcom about how long the process might be to change the law. “I remember him saying it took six years in Illinois to get a program,” Gaer says, “And here we are, four legislative sessions later. it’s awesome.” MedPharm Iowa is a subsidiary of the already successful company Kemin Industries, which makes food supplements. 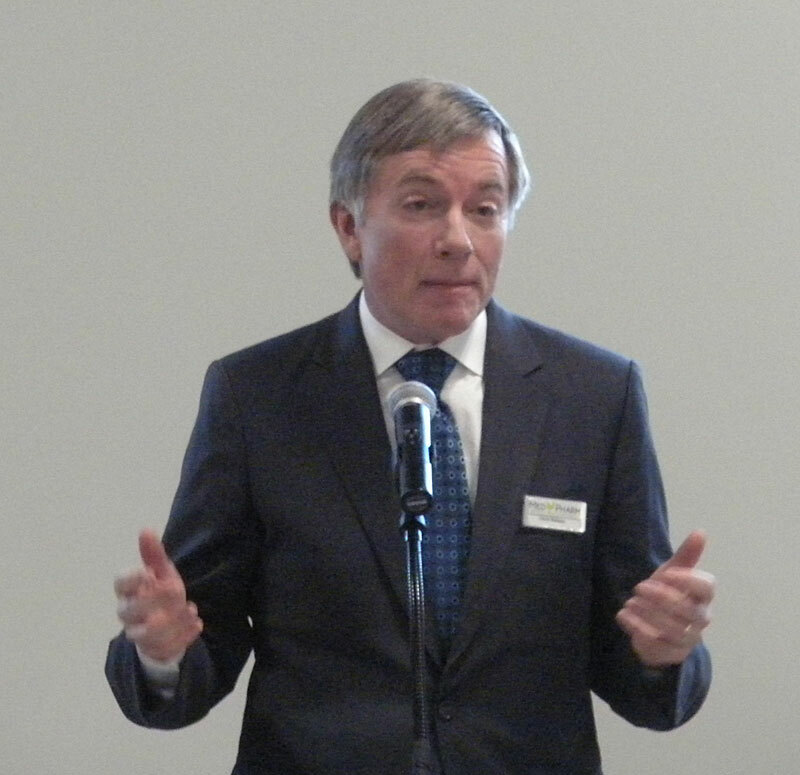 Kemin CEO Chris Nelson talked about the dedication of the new plant. “Really thrilling for us to be at this very important juncture of medical cannabis in the state of Iowa,” Nelson says. He says the Gaers are the ones who inspired him that it was “absolutely one of the things that we had to do.” Nelson says 10-million dollars later the facility can make medical marijuana products to sell in the state. “It’s about the patients, the kids, the patients who are going to benefit from these particular products,” according to Nelson. “We know from the science that’s involved that there’s real benefits to be had — and that these benefits can be realized from products that can be grown right here in the state.” Nelson pledges to keep working to find more benefits from medical marijuana. “Cannabis as a whole has been lacking very much in the science. The science of what pharmaceuticals require and the science in the application to various diseases,” Nelson says. “The promise that MedPharm makes today is that we are not going to stop in the investigation of the science.” Sally Gaer helped cut the ribbon, and then talked about finally seeing expanded medical marijuana become a reality. “It’s just unbelievable, I’m ecstatic. I mean, it’s hard to believe that something you wished for, hoped for and prayed for actually exists.” Gaer says. Gaer says showing that medical marijuana could help children was a key in getting the law changed. She nows there are still those who don’t support it. 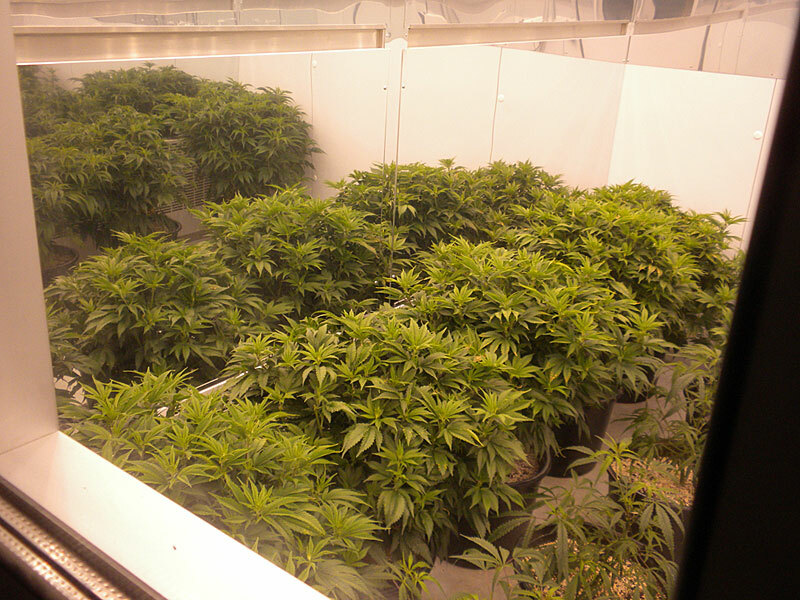 Marijuana plants growing at MedPharm facility. “People are still hung up on the ban on weed from the ’30s and the 70s and it’s not about smoking marijuana — it’s about getting medicine to people that can end all their symptoms that pharmaceuticals aren’t helping,” she says. The company can start selling its medical marijuana on December 1st.